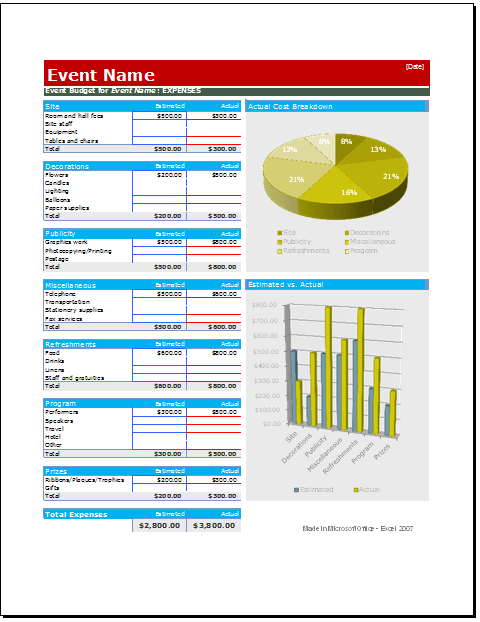 Event budget planner – When an event has been held, and all the bills have been paid. It is helpful to know how accurate the initial estimates were. The estimates could be based on the experience of the planner, or could have been obtained from the vendors that supplied the services. However, there are always extras, last-minute changes, accommodations for persons with special needs and other similar items. The Even Budget Planner shows the estimated and actual costs but also displays them in a bar graph format, so with a quick view, the planner and those working with him, can see how close they came to the budget. With this knowledge, it is possible to figure the percentage increased in what was thought to be the actual cost and factor that additional cost into next event or adjust the event in such a manner to include or possibly avoid the extra costs in the future.